9+ Crypto and Bitcoin Stats - Cryptolinks - The World's Best Cryptocurrency Sites List! Looking for the best tools to monitor cryptocurrency statistics? Look no further, we’ve you’re your back. Here, there are over nine (9) sites in the Crypto stats category. These sites have been thoroughly scrutinized and well examined and they can be regarded as reliable as well dependable enough to serve your needs. 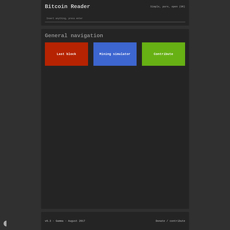 Some of these sites include TradeBlock, Coin Dance, p2sh.info, Bitcoin UTXO Stats, OP_RETURN, Blockchain Reader and so on. On some of these sites, you can get access to tracking tools, which give accurate and reliable readings and reports. 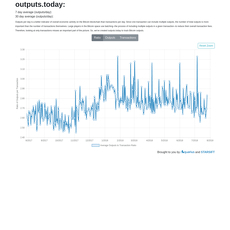 Some of these sites such as outputs.today helps tracks the total number of outputs of the Crypto network most especially Bitcoin instead of following transactions per day. It tracks down the total number of outputs for a more accurate economic indicator because one transaction can include multiple outputs and lots of experts in the market tend to bundle their outputs into larger batches to cut down on transaction fees. On some of these websites, one can get access to ratios, outputs and transaction all in one click. Some of these sites helps show which countries are trading the most volume of crypto especially Bitcoin on P2P exchange. 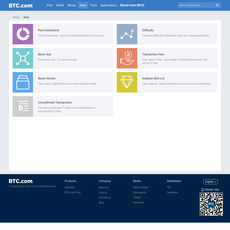 Some of these sites help give access to useful and detailed information on Blockchain related subjects in which one can view all the details of a block including block height, block depth, transactions, size, transaction time, previous block, nonce, and so on. It also helps provides statistics on individual blocks but it might be able to provide access to information on the network statistics on a big picture overview. 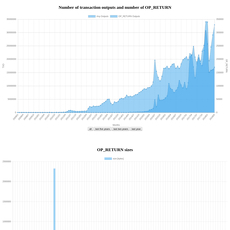 Some of these sites give access to useful information in form of charts and graphs showing the number of transaction outputs and number of Op_Return, the number of outputs with the number of OP_Return outputs against time, OP_RETURN sizes, how the chosen metric varies over time and users can choose from the menu on the right-hand side or upper side which metric they wish to display, the Op_return by size and the most used sizes, OP_RETURN protocols and so on. 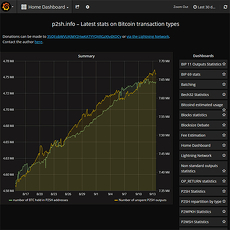 Some of these sites also provide access to helpful information in form of charts showing yearly-unspent transaction outputs on the Bitcoin network since 2010 till date. On some sites, one can get access to useful information on a kind of Cryptocurrency such as how Bitcoin has increased in popularity overtime with clusters increasing as well as how it has struggled to keep up with transaction volume demand as it has increased in popularity all in form of charts usually yearly. Some of these sites also make available access to updated information through their blogs in form of articles such as Goldman Sachs’ effect: Analyzing the Bitcoin crash on September 5th, the current state of Bitcoin ETF etc. which have proved useful, educational and informative. Some of these sites on this platform are open-source, free and easy to use. This open-source feature is very useful as allows any individual with a node to run the block explorer on it. Some of these sites help make available address for donations in case you're a philanthropist who is willing to donate or contribute to the team. On some of these sites one can get access to play games such as poker with Bitcoin. Some of these sites allow access to subscribe to their newsletter in order to be able to get notifications about important information. Some of these sites have made your need available for free and at your reach in which you can just get a phone and with a few clicks you can log on. Some of these sites have also made available access for users to advertise and earn Bitcoin. 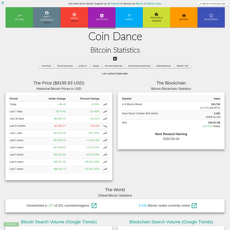 Some of these sites help provide access to a lot statistical information such as Global Bitcoin statistics, search volume, Blockchain search volume, demographics, Bitcoin community demographics, community interests, community affinities, engagement by gender, engagement by age (18+ only), engagement by device type, market cap by Cryptocurrency in USD and so on all in pie chart. 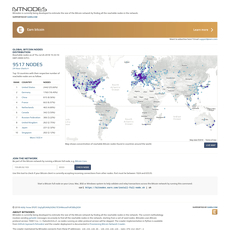 Some of these sites help provide users to check out a range of stats about the bitcoin network with different icons neatly arranged allowing easy access to stats that might interest the user. Some of which are include pool distribution, block size, block version, unconfirmed transactions, difficulty and so on. 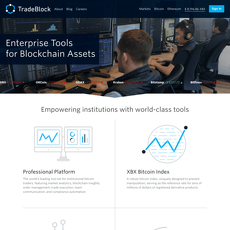 Some of these sites help provides detail reports on market analytics, trade execution, and team communication to provide knowledge into the market. 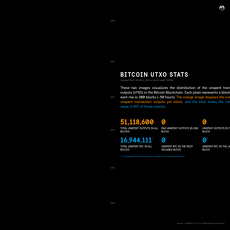 Some of them also have a XBX Bitcoin Index, which helps track the price of Bitcoin. In conclusion, most of these characteristics listed above are the reasons why a lot of Crypto individuals make use them when it comes to checking of trading statistics.